Successfully Added 4 E27 RGBW LED Light Bulbs - 500 Lumen, 6 Watt, 30000 Life Span, Remote Control to your Shopping Cart. 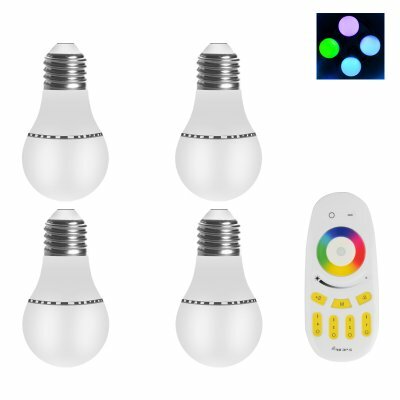 Save money and enjoy easy to control lighting throughout your home with pack of 4 RGBW LED light bulbs and 2.4Ghz remote control, suitable for E27 bulb fittings. The colorful LED blubs are dimmable and can emit between 20 to 500 lumens, which is equivalent to a 40W incandescent bulb, the added bonus being that these LED bulbs use only 6 Watts of power each, so they are more than 6 times efficient. Unlike CFL bulbs they turn on instantly and don't need time to warm up before emitting the best light. With a life span of about 30,000 hours they will outlast any other bulbs and bring you great savings on your electric bill. With the handy 2.4GHz touch remote control you can easily change the color and brightness from up to 10 meters away so you don't have to get out of your seat. Select any bulb individually, or multiple bulbs in this set and control them together, adjusting the brightness and color hue to set the atmosphere to suite your mood. With a color wheel and brightness bar you can get the setting just right for that romantic evening in, or to bring some festive spirit to your household. This pack of 4 LED bulbs is an environmentally friendly way to cut emissions and do your bit for the environment while also saving you money, it comes with a 12 months warranty and is brought to you by the leader in electronic devices as well as wholesale LED light bulbs..